ITW SYSTEMS has been manufacturing LED light fixtures for 7 years. 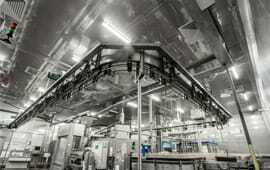 We produce lights and modernize lighting systems on the per order basis for each particular facility. We produce LED lights according to the requirements and conditions of the Customer, and do not adapt existing items. We manufacture only customized lights (if, for example, you need a light of 73 W, we provide just this kind of the light, not compromise with a light of 70 W or 80 W). We design LED lights with a reserve for power and light intensity. Our lights will lose no more than 30% of their brightness after 5 years. Full warranty for 5 years with the option of extending for another 5 years. High energy performance and quick payback (as short as 1.5-2 years).